Cheese + pasta. One of life’s ultimate combinations. 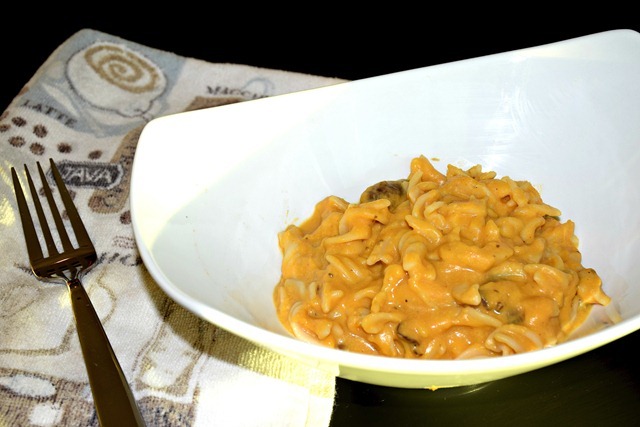 You may not think so right now but adding butternut squash to the mix takes mac n’ cheese to a whole new level. This is one of those don’t knock it until you try it moments. Trust me! Now, when it comes to my homemade mac n’ cheese recipe, I have always opted for sharp cheddar cheese. But this time I went in a different direction by using Fontina…and nutritional yeast. Again, you have to trust me on this. The sweetness of the butternut squash pairs so well with the creaminess of the Fontina. And the nutritional yeast? Well, that was added for extra nutty flavor. I researched and looked at 10 different recipes (this one being the main catalyst) before deciding to put my own creative spin on the dish. Both Vishnu and I really love my original recipe, so I definitely wanted to keep elements of that in whatever it was that I made. With that being said, I present to you my version of creamy butternut squash mac n’ cheese with sautéed mushrooms. Put another way, a delicious way to incorporate pasta, cheese, and veggies into one complete meal. You’re very welcome! Heat a large pan over medium-high heat and add 1 tablespoon olive oil, salt, pepper and butternut squash. Mix well and then add water. Cover pan and turn the heat down to medium-low. Cook for 20-25 minutes, stirring occassionally. You know the squash is ready when it can be mashed easily with a fork. Transfer squash mixture to a high speed blender or food processor and puree. Add the pureed squash and almond milk to pan (over low heat), mixing until incorporated. Add mustard, cayenne pepper and nutritional yeast. Add the cheese and stir until combined. Taste and season with more salt and pepper as needed. Heat a separate pan over medium-low heat. Add 2 teaspoons of olive oil. Add mushrooms and cook for 5-7 minutes (until mushrooms are tender). To bring everything together, mix sauce with pasta and then add mushrooms. Gently combine all three elements. Plate and serve! Vishnu and I love our mac n’ cheese extra creamy. If you’re like us, this is for you. Every single piece of pasta was covered in sauce. Basically, it was mmm mmm mmm! And on a completely different note, I AM SO EXCITED because I AM FLYING HOME (to Atlanta) tonight for a family wedding. Always a good time! And the best part is that Vishnu will be joining me on Friday. Woot woot! Can’t wait to see my parents, sister, and extended fam! A medium butternut squash should be perfect. I thought the one I used was pretty average but I got a lot out of it. You can always adjust the amount of milk and cheese you use too depending on how much squash you have. Let me know when you make it! Hope it warms up for you. It is SO cold! Thanks, Laura! And yes, my mom warned me that the weather is not behaving right now. Blah! Safe flight!!! currently obsessing over Goat’s Feta. Ever tried it??! SO GOOD. When Alex and I first started dating, we made a butternut mac n cheese together, so I have fond memories of it 😉 This recipe looks amazing!